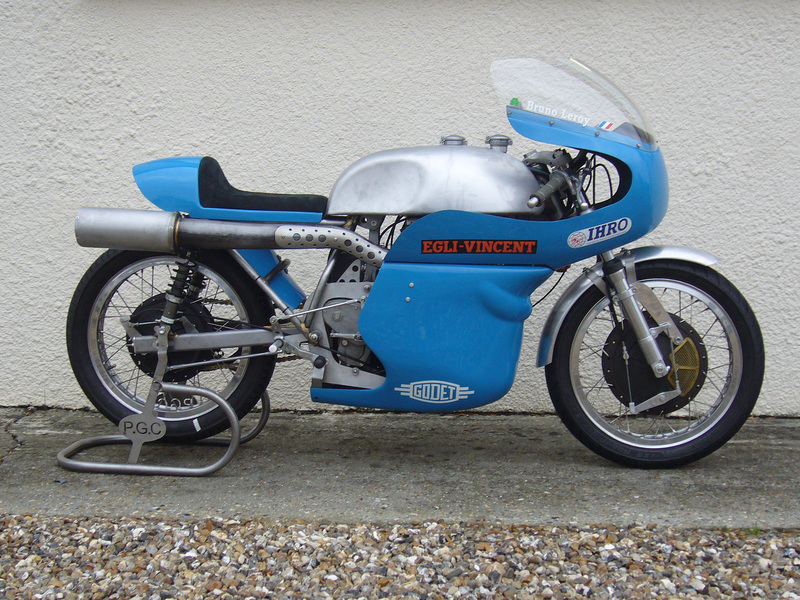 About a month or two ago, Patrick Godet introduced a new 500cc Vincent to his venerable array of twins. 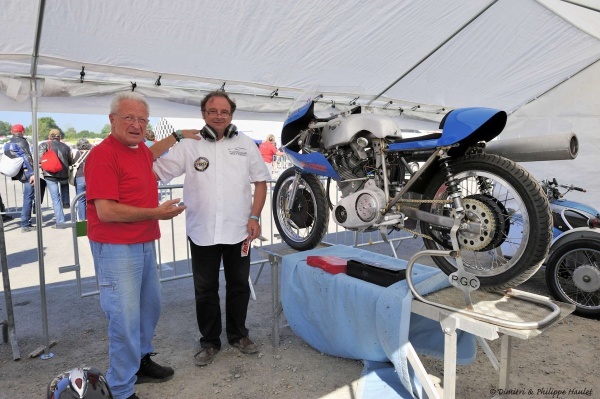 The debut was made at Chimay, Belgium at the 19-21st July IHRO races. 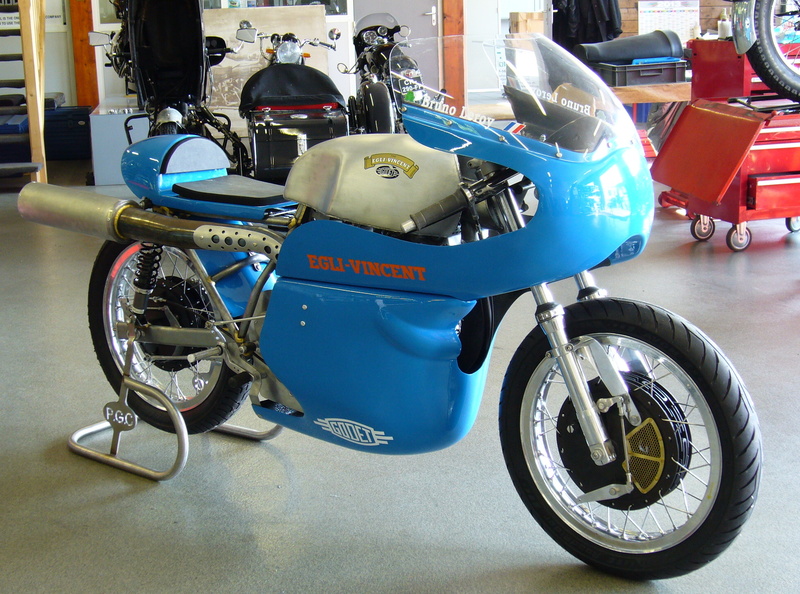 The engine made its debut in an Egli frame, which pleased Fritz Egli and the many attendees who used the occasion as the annual Egli-Vincent rally. 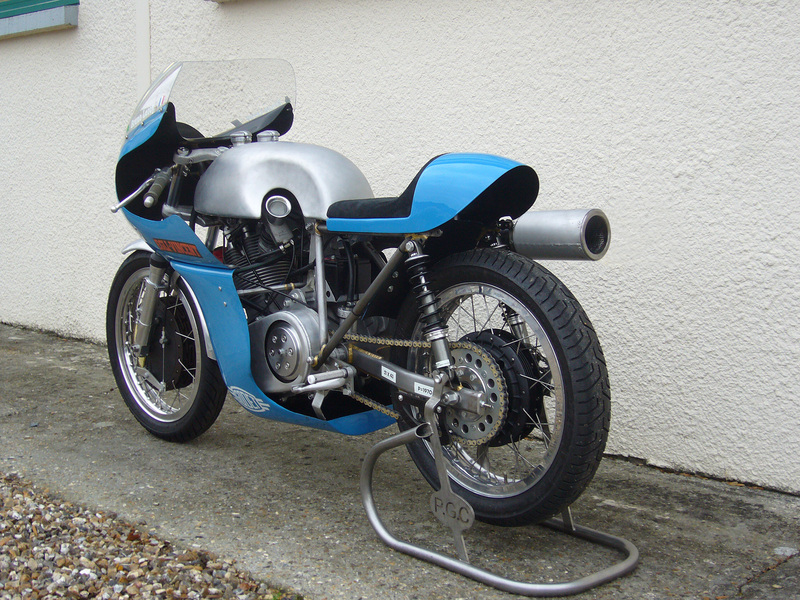 Ultimately the engine will repose in a stock chassis constructed by Patrick, but for the initial development phase a special Egli chassis was constructed. The engine is the continuation of his original ‘Ultra Short Stroke 500cc’ engine which utilized a customer-supplied crankcase that was modified by Godet to take the big bore Nicasil cylinder measuring 92mm bore x 75 mm stroke. A one-piece crank was used with a titanium rod. It was fitted with Godet cams and followers and a 38 mm intake tract. For the new engine, Godet has taken control of all the major components. He has cast all of the major items and has control of the remaining items through a few selected suppliers, who build to his specification. As a result, he has added items like a high pressure oil pump in the timing chest and a brand new five speed Albion gearbox that shifts perfectly and can handle all the horse power the engine provides. The engine is so new that it will not be ready for this season’s races. It will go through a development process that will result in the bikes entry for racing next year. In the new bike’s saddle will be the fast and likeable Bruno Leroy. Bruno and Patrick have been a team for many years. Just to keep his track time high, Bruno rode Patrick’s Manx at Chimay qualified in tenth place. 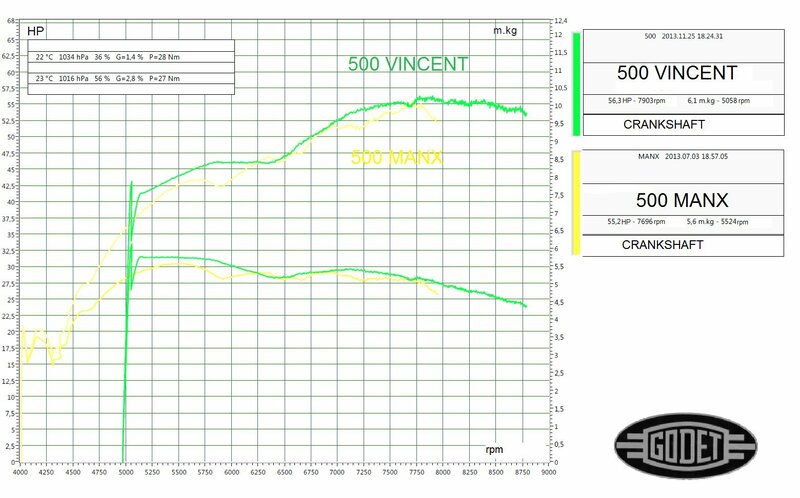 The engine is now pulling 56.3 HP at 7,903 rpm at the crank, slightly above the Patrick’s benchmark 500 Manx. The gearbox is a modern 6 Speed modern Albion. The 92 mm bore X 75.2mm stroke is a competitive architecture against the latest Manx, but it needs more development. It has Hollow valves and a modern oil pump. 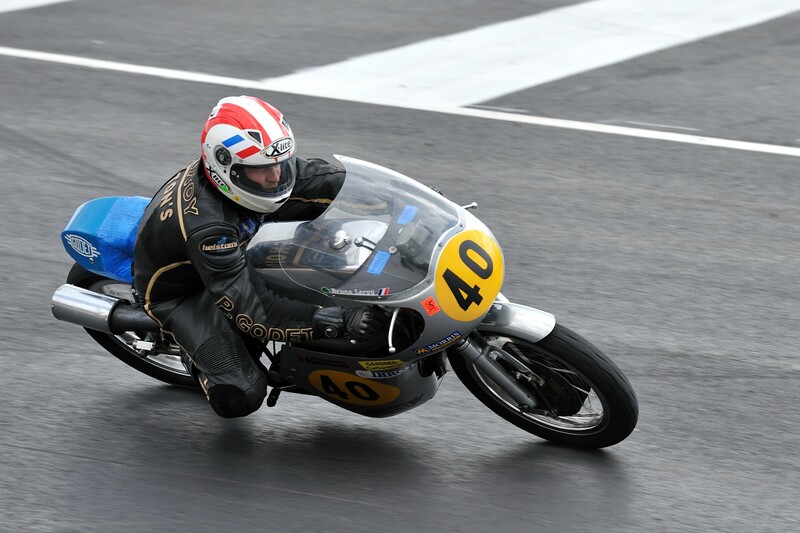 Bruno Leroy at Chimay Classic Grand Prix, a first ride for the new bike. Bruno finish Tenth with the Manx. Patrick is glad to have exceeded the figures of his benchmarked Manx. But there is a lot to do to be able to get a podium says Patrick. how much of the Vincent engine is still used ? any ? This is a tough question and Patrick Godet is the best to answer. The IHRO championship allows modification in certain limits. 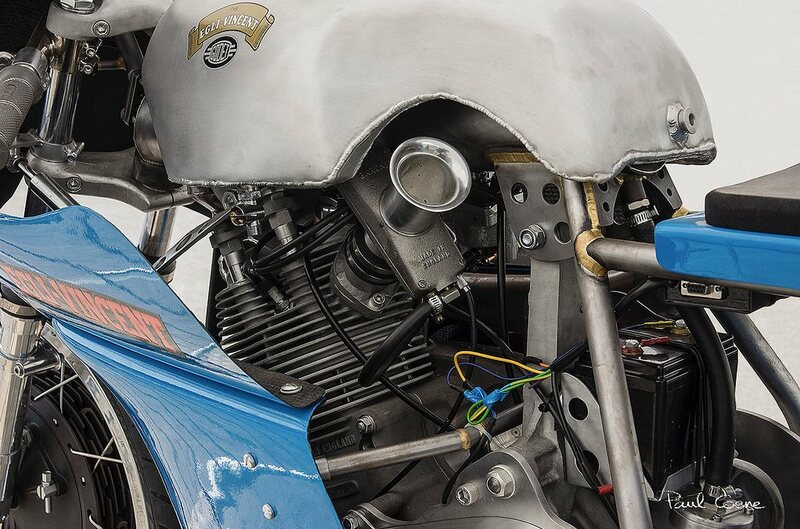 To reach this level of power, the Comet needed serious modification especially to keep up with the Manx and the G50. Remember that the Vincent is a pushrod opposed to the OHC and DOHC and was never in the tempo with those back in the 50s. The short stroke is also a must have to be competitive. Here Godet uses 92mm bore but Molnar goes to 95mm on the Manx. So to answer your question the crankcases are Vincent, the cylinder also. The head is a Godet with big port, this is the base that is used on the road machine and one of the reason that this machine breath so well.